Summary: Madison Stanton doesn't know where she is or how she got there. But she does know this—she is dead. And alone, in a vast, dark space. The only company she has in this place are luminescent objects that turn out to be all the things Maddy lost while she was alive. And soon she discovers that with these artifacts, she can re-experience—and sometimes even change—moments from her life. Her first kiss. A trip to Disney World. Her sister's wedding. A disastrous sleepover. In reliving these moments, Maddy learns illuminating and sometimes frightening truths about her life—and death. This is a haunting and ultimately hopeful novel about the beauty of even the most insignificant moments—and the strength of true love even beyond death. 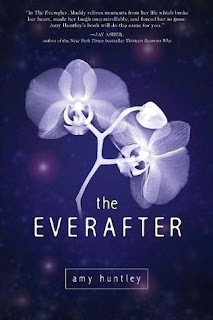 My Review: The Everafter is a fluid, easy-paced read. I was intrigued by this "after life" image from the first page. After Madison's death, instead of going straight to heaven she ends up in a dark, empty place which she calls "is." She doesn't necessarily know how she passed away but she has numerous objects there that can transport her to different stages in her life. In her visits she slowly starts to realize what great moments she had experienced when she was alive. However, she does feel other spirits present and eventually learns to communicate with them which lead her to answers of her death. I don't want to tell you too much about the spirits because I don't want to spoil anything. But, I did enjoy Madison's character and journey into finding how she passed. I was extremely shocked when her cause of death was revealed, I would of never guessed it! Overall, a great, inspirational book, it made me recognize that life is short and we should savor every moment. 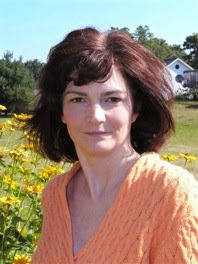 Amy Huntley is the author of The Everafter and a high school English teacher. She loves working with teenagers, both as a writer and a teacher. She is grateful for their enthusiasm and fresh approach to life. She loves music, writing, reading, attending theater productions and talking about books with people. She lives in Michigan with her husband and daughter. I attempted to write my first book the summer after fifth grade. I don’t think I had any real intention of becoming an author at that point. I just enjoyed writing! That attitude continued for me through middle school. When I was in 9th grade, though, I got more serious about becoming an author. I wrote all the way to completion my first attempt at a Young Adult Novel, and even asked a local community college professor for help with the process of revision. 2) What inspired you to write The Everafter? A conversation in the lunchroom one day among teachers gave me the initial idea for the book. Some of my colleagues were complaining about objects that they had lost and how annoying it was. One of the teachers said, “Wouldn’t it be funny if all those things turned up after you were dead when they wouldn’t be of any use anymore?” That got me thinking, and I soon started structuring a plot around the premise of finding lost objects after death. Honestly, though, I noted the conversation and was drawn so strongly to the idea because I’ve always gotten a bit too attached to objects. I can mourn the loss of something as insignificant as a pencil! That’s why I knew that in any story I wrote, the objects in it would be useful to the character—even if they didn’t show up until after she was dead! 3) Are the characters in the book based on someone you know? I’d have to say that for the most part they aren’t. The good characters in my book are people I wish I could know. The more unstable and “bad” characters in the book are exaggerations of the worst qualities I encounter in a variety of people. They sort of get rolled together into new creations. What I tend to borrow more from my experiences with real people are the situations they find themselves in. Some of these are borrowed from my own life, too. For example, like the novel’s main character, I once dated a guy who’d been with the same girlfriend for two years. Luckily, I, and the ex-girlfriend, reacted to it quite differently than the characters in my book do. 4) What was the hardest part of writing The Everafter? Wow. This is a tough question. There were a great many difficult parts of writing it. I found it pretty hard to try to think like Maddy at a variety of ages. The lost objects she finds after death take her back to moments in her life ranging in age from 18 weeks to 17 years. While she’s visiting those moments, she gets to actually (re)live the events. Figuring out who she would have been at those ages was tricky as was expressing her thoughts in a way appropriate to the age. The 2-year-old Maddy was the most difficult of all to create. Another tough part of writing the text was dealing with the time travel element. When one of Maddy’s lost objects takes her back to a moment in her life, she sometimes changes events in those moments. Even though the changes are minor, they can have huge significance for what happens to her as a person (and—from a writing standpoint--for what happens to other sections of the text.) My brain got tangled in several places trying to make sure all of those elements worked. My editor, Donna Bray, was very helpful with that. She caught some pretty important inconsistencies in the way I dealt with time. 5) If you had to sum up The Everafter in one word what would it be? Acceptance. 6) Since you're an English teacher, how do you make reading fun in your classroom? Never successfully enough to suit me! I do a lot of different things, but every year there are still kids who leave my room unhappy about a book they’ve had to read (or even worse, not really liking reading at all). These problems are partly the result of an educational system that expects all kids in the same grade to have the same interests and abilities so they can be taught as a group! I combat this as much as I can within the required curriculum by offering reading choices to kids. When we all have to read the same text, I try to liven it up with acting assignments, role-playing, creative writing assignments, class discussions, guest speakers, and art projects. As far as I’m concerned, a student is never too old to be handed crayons or colored pencils! All the attention my book’s cover has gotten has only reinforced that belief on my part. 7) Are there any new authors that have sparked your interest? Janice Hardy will be debuting with me on the Balzer and Bray line, and I really enjoyed her mid-grade novel, The Shifter. It has a fascinating concept, and I’m looking forward to the sequels. I also enjoyed R.J. Anderson’s Faery Rebels. I was completely charmed by the romance in Cassandra Clare’s Immortal Instruments series. 8) What book are you currently reading? I tend to read in threes for some reason. Right now I’m working on The Hunger Games, In the Wake of the Plague and Ghostwalk. 9) Do you have anything specific that you want to say to your readers? I appreciate them tremendously! They are the most important piece of the writing equation for me, and I hope I can satisfy as many as possible with my storytelling. 10) Tell us something about yourself that no one knows about. No one?! That’s hard. Hhhmmm…I guess no one knows that I’ve always had a secret desire to have long, long hair! Mine is thick and wavy, so having it long has always been problematic. Now that I think about it, I usually envision my female characters with long hair (and theirs is more cooperative than mine!) Guess that’s probably as close as I’m going to come to fulfilling my dreams of long hair. Wow great review and interview! I'm almost done with The Everafter, I'm anxious to find out how she died. I know that's a weird thing to say but all the reviews say they were so shocked to find it out! Oh woops, I don't know why that came out as anonymous? Anyway that was me who posted the last comment. Sorry! The cover of this book pulls me in. Thanks for the review. I'll be picking it up in the future I'm sure. In October I'm hoping to make it to Amy's signing in Grand Rapids, MI, which is only 45 minutes from where I live! I've had mixed felling about this book, but i'll def. read it now! This sounds very appealing--a lot like the lovely bones. I'm looking forward to the Aussie release. I really like that you combined a review and interview. I have been doing them in two separate post, but combining them works well! Thanks for joining the Book Review Party. Be sure to check back Friday AM when I announce the winner of the $25 Amazon GC. I really want to read this book. That was a fantastic interview. 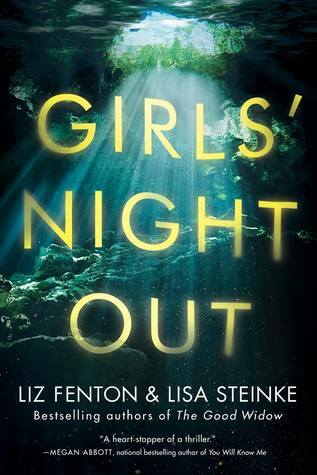 I love the cover too- so pretty! THANKS for sharing this across the pond, I'm really interested in this book - great review and interview, too! Great interview! I would like to read this book right now. Great interview. I was interested to read your review since I just finished this book. I liked it and thought it was thought provoking. Definitely a fast read as I finished it in a few hours. I liked the characters too. Hi, everybody! Thanks for the interview, Eleni. Sara, I hope I do get to meet you next month in GR! I really loved the interview. I have a 3 girls who are avid girls for which two of them love to write. I really like how Ms. Huntley describes what she tries to do to maintain students interest and/or spark the love for reading further. One of my girls' best teachers used alot of methods she described.